Once you have created a rule with the rule designer, a new option appears: "Edit Script"
If you use that, you are actually editing a Sieve script. Sieve is a mail filtering language and editing the scripts directly allows you to do things that the wizard rule creator will not. This says if the mail says it comes from "support@yourcompany.com", but doesn't have a received header that matches your IP address, it's junk. You can't create that rule with the wizard because the wizard doesn't know about "header" matches. You probably need a more complex rule, but this is the basic idea. Rules tested against From and To headers have a peculiarity which might be beneficial. 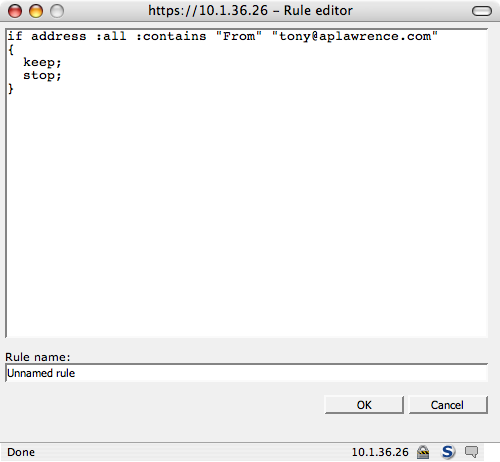 If these rules go before the others, they will be tested on level of SMTP traffic. 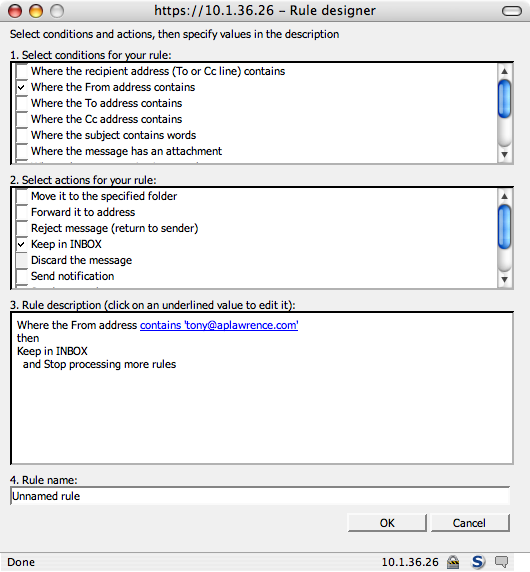 In case of denial rules, messages matching such a rule are blocked even before accepted to the queue of incoming messages. This decreases the load on the server. It helps the server avoid taking several actions and using of several tools such as antispam tests and antivirus control which is applied once a message is accepted to the queue of incoming messages. In case of permission rules, no other rules are applied if they are tested on level of SMTP traffic. Search Google for "sieve script examples" to find other folks scripts. 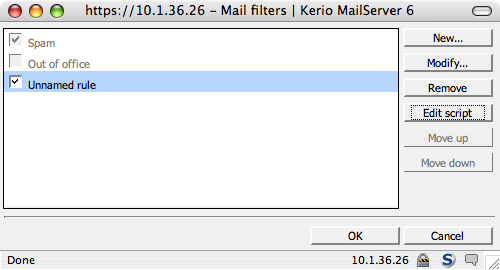 If you have access to the Kerio server itself, you can also edit user's "filter.siv" files with a text editor.